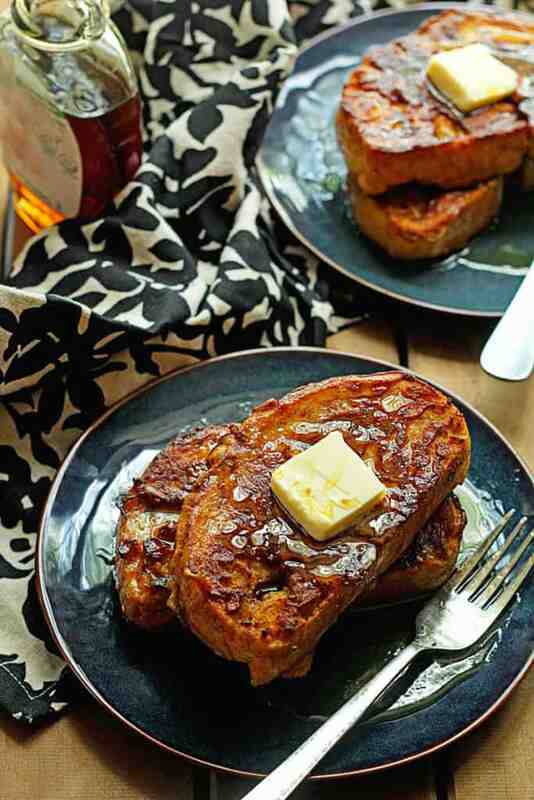 Pumpkin Spice French Toast – A perfectly delicious pumpkin spice french toast recipe is here to make your Fall mornings so much better. Now that I’ve started to ease into this season, I’ve realized that Fall mornings are the best. There is a lazy feel to them that isn’t quite there during the spring or summer. Fall is the perfect season to make easy French toast, and my Pumpkin Spice French Toast is delicious and super easy to make! This pumpkin spice French toast recipe is so fantastic. Those fall spices we all love are found throughout the entire recipe, and the whole thing is absolutely divine. If you ever wanted to eat pumpkin pie for breakfast, you are in luck because this pumpkin French toast has all the flavors and more! of the best canned pumpkin recipes ever! A bit of pumpkin puree is added to beaten Safest Choice eggs and spiced up with brown sugar, cinnamon and nutmeg to make the most decadent custard to drench bread in ever. Fry this pumpkin French toast in a bit of butter and to make the edges super crisp while the inside stays tender and doughy. Try it and see for yourself. Your favorite fall breakfast is here to stay. 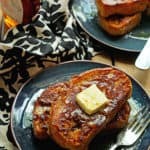 Pumpkin Spice French Toast - A perfectly delicious pumpkin spice French toast recipe is here to make your Fall mornings so much better. Whisk together Safest Choice eggs, pumpkin, heavy cream, brown sugar, cinnamon and nutmeg until smooth. Carefully dip one side of each slice of bread into egg mixture letting it soak into the bread for a few seconds then repeat on the other side. Set aside each slice. Heat butter in a skillet until melted and starting to bubble. Add each slice of bread to the skillet and saute' in butter until golden brown. Repeat on other side then remove and set aside. (Tip: I like to turn the oven on to 225 and add the french toast to a baking sheet to keep it warm until all slices are done). Repeat with all slices then serve. I am so glad I stumbled across your blog, this is gorgeous. I’ll have to try this this weekend. Hooray I am so glad you are here too! 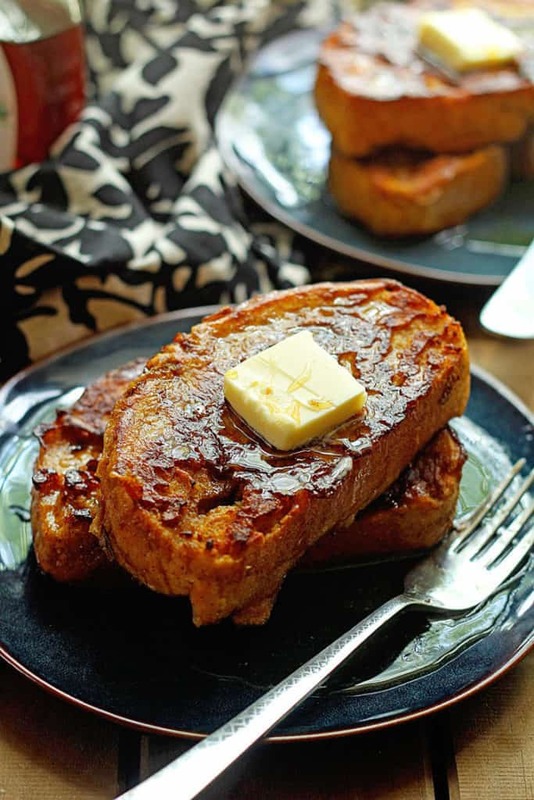 This pumpkin french toast looks absolutely divine!! Thank you so much! It is such a favorite of mine now! Just finished devouring this! We had it with homemade apple butter, maple syrup, and local bacon. It was absolutely divine! Thank you for the recipe – it is definitely a keeper! Hooray so glad you enjoyed it! I’m coming to your place for breakfast! I love french toast. It is my favorite breakfast!! Fall fall fall fall fall fall fall fall!! I need this in my belly. Man, I need someone to make this for me STAT! This would be THE best fall breakfast! Your photos are beautiful and make this look so warm and inviting! Okay, so I get to work at 6, so no lazy fall mornings. But in my dream world, if I did have the time, this is how the morning would look. I would also be extremely glamorous while ate this French toast. Hey, a girl can dream. This looks so fabulous! Oh my goodness girl this is on another level!!! And your description has my mouth watering! Gorgeous pics, incredible recipe! Yummy, adding this to the must make weekend brunch menu! This is the french toast of my dreams, can’t wait to make this for my boys! Wow! Looks amazing! A great day starts with a yummy breakfast like this one. I seriously adore safe eggs!! And waking up to this for breakfast would make the mornings so much better! Loving this – pinned! I would love to wake up to a couple of slices of this french toast! I need this in my life every morning though my hips probably don’t agree. I want to get all cozy with this french toast. Looks amazing. And I totally agree that Fall mornings are just meant for snuggly, comforting breakfasts like this one. Gorgeous photos, girlfriend!! I couldn’t agree more, girlfriend- fall mornings call for leisurely getting started and soaking in the fall morning air… preferably in pj’s until noon. 😉 And a sensational breakfast is always preferred! This Spiced Pumpkin French Toast totally fits the bill! This looks crazy good, J!!! Pinned! Cheers to a day as fab as this french toast! This and pjs go together perfectly! I’ve been going absolutely crazy with pumpkin lately. It has been all pumpkin everything. Girl, this French toast is definitely going to make an appearance this weekend. Pinned. This is what my french toast dreams are made of! Literally so stoked for fall because of all the pumpkin things! Woot woot Fall is here! The golden crust on that French toast is UNreal — I am a total breakfast fanatic. Love this! All my pumpkin boos! Stand up! Sounds wonderful Jocelyn! The perfect fall breakfast treat! This french toast is the brunch of my dreams 🙂 I’m having Saturday cravings on a Monday! Pinning! This french toast is the toast of my dreams as well girlfriend! I think it’s time I step up my french toast game. This spiced pumpkin version sounds phenomenal. You totally need to get your french toast game up to par haha. I don’t make French toast very often, so when I do, it needs to be epic. Love that this is a spiced pumpkin version. I must try it soon! Hooray yes try it out and let me know what you think!